Ingredients : 6 petites crepes, 1/4 cup chopped chives, 1 tablespoon olive oil, 2 cups chopped zucchini, 1 1/4 cup chopped green beans, 1 cup fresh corn kernels, 1 cup part-skim ricotta cheese, 1/2 cup shredded Monterey Jack Cheese, salt and pepper. Recipe : Heat oil in a large nonstick skillet over medium-high heat. Add zucchini, green beans, corn and cook, stirring, until beginning to brown, 6 to 8 minutes. Reduce heat to low; stir in ricotta, Monterey Jack, the chives, salt and pepper. Cook, until cheese is melted, 1 to 2 minutes. Remove from the heat. Reheat crepes as it is explained on the packaging. Place the vegetable mixture on one side, and close with the other side of the crepe. Bon appetit ! Ingredients : 6 petites crepes, 6 slices of smoked salmon, 1 cup of creme fraiche or sour cream, the juice of 1 lemon, dill sprigs, extra to cover, salt and pepper. Recipe : Blend together the sour cream (or creme fraiche), the lemon juice and a bunch of dill sprigs, finely chopped. Season with salt and pepper, cover and leace in the fridge until needed. Reheat the crepes as it is explained on the packaging. Spread the mixture on one side, and close the other side. Top with chopped drill. Bon appetit ! 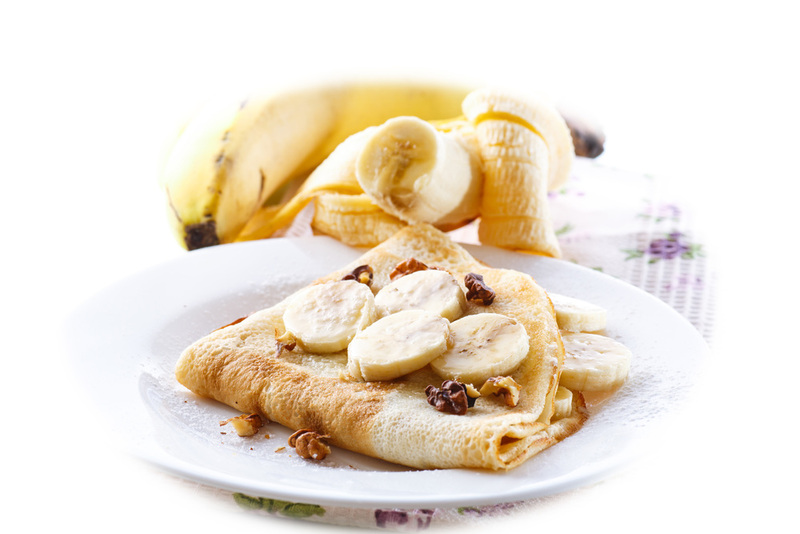 Ingredients : 6 petites crepes, 2 tablespoons salted butter, 1/2 cup chopped walnuts, 3/4 cup maple syrup, 3 bananas, sliced. Recipe : Cook walnuts in butter in a non-stick skillet on medium heat for 2 minutes, stirring occasionnally. Add 1/2 cup maple syrup, heat to simmering and reduce 5 minutes. Add bananas and remaining syrup, simmer 3-4 minutes. Top crepes with bananas and syrup. Enjoy ! Ingredients ; 6 petites crepes, 2 tablespoons butter, 2 tablespoons brown sugar, 1 teaspoon cinnamon, 2-3 apples cored, peeled and sliced, whipped cream for serving (optional). Recipe : Heat pan over medium heat and add butter. When the butter starts to bubble, add apples and cook until softened. Add brown sugar and cinnamon and cook 3-5 minutes, until fully soft. Generously spoon apple fillinf onto the center of crepes, from the bottom to the top. Roll up, add whipped cream. Yummy !